Powerful, convenient, and performance focused, our range of Zanussi tumble dryers have been designed to make your life that little bit easier when it comes to drying your clothes quickly and efficiently. 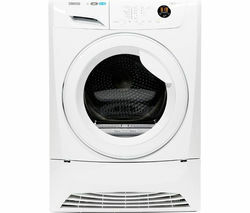 Ideal if you have a busy lifestyle, a Zanussi tumble dryers feature a number of user friendly functions, such as straight forward button controls that allow you to select, start and stop your laundry cycle with one easy click of a button, as well as an ergonomic EasyClean filter, which helps to keep maintenance to a minimum. After all, when you’re running a busy and demanding household, the last thing you want to worry about is your tumble dryer letting you down, especially during the colder, wetter months when drying your clothes outside is almost impossible. An invaluable part of your laundry day, our Zanussi tumble dryer range will comes with a number of other performance enhancing features, including up to eight different programmes to ensure that your clothes receive the best possible treatment, sensor control which automatically stops the load once it is dry, as well Zanussi’s Easy Iron program, which conveniently reduces creases and wrinkles. So what are you waiting for? Explore our comprehensive tumble dryer range including Hoover, Beko, Bosch, Hotpoint tumble dryers, and more.